Moments before Rebbe Shimon left this world he gathered his students and told them that this should be a day of joy and celebration. Countless people have seen tremendous yeshuos because they have contributed to increasing the simcha of Lag B’omer. Either through yeshuos for children, marriage, livelihood, or health, thousands of people have been helped through the promise of Rebbe Shimon Bar Yochai. 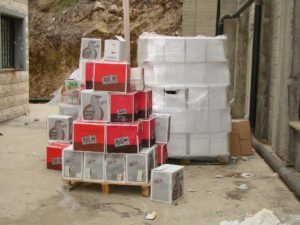 The Ta’amei HaMinhagim says that numerous people that had difficulty having children, finding a shidduch, recovering from an illness or attaining a livelihood were successful only after they donated “Chai Rotel” for the Lag B’omer celebrations in Meron. Rav Ovadia M’Bartenura and the Sheloh Hakadosh also confirm the success of donating to increase the simcha of Lag B’omer in Meron. We are offering you the opportunity to merit the salvation of Rebbe Shimon even thousands of miles away. Rav Aharon of Karlin says that all those who believe in Rebbe Shimon will be uplifted by Rebbe Shimon. By donating Chai Rotel and increasing the simcha of the celebration in Meron, Rebbe Shimon will increase simcha in your life! Rotel is an ancient measurement, 18 rotel is roughly 54 liters. 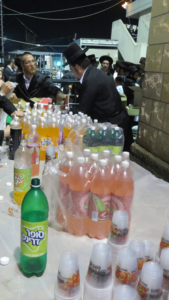 Rabbi Yehudah Leib Horenstein writes that he met two people on Lag B’omer in Meron that donated Chai Rotel and had children after more than 10 years of marriage. The Bobover Rav, The Kedushas Tzion sent a letter from Poland to his Chassidim in Israel asking them to donate chai rotel in Meron on this holy day on behalf of a couple that did not have children. On the day Rebbe Shimon left this world, a fire was ignited that will never be extinguished. On each and every Lag B’omer sparks fly from the fire to ignite the hearts and minds of all the Jews present, inspiring them to turn their lives back towards Hashem. It is non-other than Rebbe Shimon bar Yochai who proclaimed, “I can absolve this whole generation from din”. Imagine that you too can have a part in this great simcha. We invite you to come and join us in the Simcha L’kavod Rebbe Shimon Bar Yochai. If you are not able to come to Meron but would like to be there in spirit, you can still have a portion in this great simcha and Rebbe Shimon Bar Yochai will increase the simcha in your life!